Forecasters had predicted showers and cold winds but parade fans were not deterred and their loyalty was rewarded with blue skies. From Ireland's earliest parade - held in Ballydavid, Co Kerry, at one minute past midnight, to the only event where a rescued horse was the star of the show in Kinsale, Co Cork - the crowds were out in force. Cork again boasted the largest parade outside Dublin where former Olympian and world champion race walker Rob Heffernan took the lead as Grand Marshal. "It's a huge honour - I'm absolutely thrilled," the athlete said. 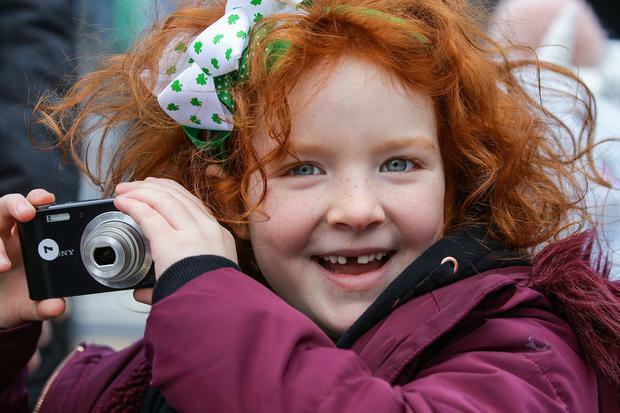 An estimated 100,000 people attended the Cork parade and festival, an event further boosted by the official debut of the city's newly refurbished St Patrick's Bridge. The parade featured US marching bands, including the Mandan Braves from North Dakota, the Arvada West High School Band from Colorado, the Knights of Columbus Pipe Band from New York, and the Columbus East High School Band from Indiana. In Limerick city, many attending the parade were surprised by the absence of the All-Ireland hurling champions from the festivities. Last August, the hurlers paraded through the city's streets in an open-top bus after returning the Liam MacCarthy Cup to the county following a 45-year hiatus. 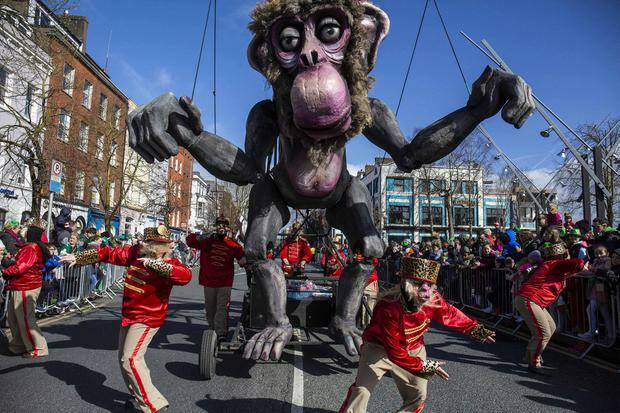 Lumen street theatre "One Giant Leap", taking part in Limericks Saint Patrick's day parade. Photo: Sean Curtin True Media. In what many in GAA circles have seen as a snub by the local authority, the team was not invited to participate in the event. A council source said the team hadn't applied to take part. "They could have filled in an application form like everybody else, but they didn't do that. "Everyone involved in the parade, bar the grand marshal, had to fill out an application form," they added. A Limerick GAA spokesman said they did not wish to comment. However, sources in GAA circles said they were annoyed the All-Ireland champions were not asked to join the parade given their historic victory at Croke Park. As the senior players were not engaged in competition, they would have been free to appear in the city parade. However, the Liam MacCarthy Cup did make an appearance at the Kilmallock parade in Co Limerick along with young local players. An estimated 40,000 people turned out to see the Limerick city parade and watch it online for the first time. The event was led by Grand Marshal Dr Norah Patten, who is bidding to be the first Irish astronaut. He came up with the idea in the 17th century that the saint should be honoured with a special Church holiday in Ireland. Local couple Des (84) and Mona (83) Monahan served as the Waterford parade Grand Marshals. The honour was bestowed in recognition of how their remarkable love story - which saw Des learn how to apply Mona's make-up as she was losing her sight - went viral worldwide and garnered them TV appearances across Ireland, the UK and US. However, the popular tourist town of Kinsale threatened to steal Cork's thunder thanks to another viral sensation - Paddy the Horse. Paddy was rescued by Kinsale RNLI just minutes before he seemed certain to drown on February 17 and footage of his rescue made headlines worldwide. He was being washed down by his owner Paul Crowley in the Bandon River when his hoof became wedged in a submerged oyster bed. With the tide rising fast, Paddy faced certain drowning. However, RNLI volunteers Jonathan Connor and Michael O'Sullivan defied the cold and conditions to enter the water and successfully free the horse. "We asked Paddy straight up did he want to take part in the local parade - yay or neigh," Jonathan joked. "He didn't neigh so we took it as a yes." The first parade yesterday was held in Ballydavid in west Kerry at precisely one minute past midnight as it stole a march on Dingle, which kicked off its parade at 6am with a pre-dawn fife and drum show. Leading out the parade was the Dingle Pipe and Drum Band. Glounthaune featured Ireland's shortest St Patrick's Day parade while Fermoy boasted Irish rugby hero Mike Ross as the Grand Marshal. It was a proud homecoming for the rugby star as he attended St Colman's College and started his career with Fermoy RFC. In Killarney, an estimated 10,000 people lined the streets of the town for the colourful parade which, as is traditional, boasted a very strong American participation and this year featured a circus-theme with 'The Greatest Show'. There were lots of red noses and much clowning around - not to mention giant balloons and a high-octane performance from The Scorchers cheerleading club. Killarney's strong links with Germany through the Liebherr factory, which stretch back more than half a century, were reflected in the three German marching groups. Tralee's parade boasted not one but two Grand Marshals - Ryan Kelliher (8) and Rose of Tralee boss Anthony O'Gara. Ryan was specially honoured for his brave battle against muscular dystrophy. In Tipperary, the Clonmel parade featured the unveiling of a special plaque to commemorate the four Premier County participants in the first Dáil 100 years ago. Meanwhile in Galway, more than 30,000 people celebrated the St Patrick's Day festival with the city set to act next year as European Capital of Culture. The City of Tribes also launched a world record attempt for the largest crowd singing the 'Fields of Athenry' at one of the liveliest parades in the country. In 2016, Galway production company KamilFilms brought together 15,000 people on the streets to film the world's biggest performance of 'Galway Girl' with Sharon Shannon and Mundy. That video has notched up five million hits since it was first released. The new record bid got under way yesterday with the call out for people around the world to record themselves, family and friends - and anyone who knows the words to 'The Fields of Athenry' on St Patrick's Day. Film director Kamil Krolak, from the company, said: "We want the footage posted on any social media outlet with the hashtag #MyFieldsOfAthenry by March 20, where it will be edited to form the first truly global video of 'The Fields of Athenry'." In Bray, Co Wicklow, 1,500 participants joined the parade which featured a host of multicultural communities. The town will continue its celebrations with events over the coming days, including a showcase of classic cars from Bray Vintage Car Club today.